Ford Motor Company will unveil a new one-off 2011 Mustang GT Glass Roof Coupe for sale at the Barrett-Jackson auction on January 23 in Scottsdale, Arizona. The winner of the auction will then be able to watch their car pace the field for the 2010 Daytona 500 on February 14, adorned in a unique paint design created specifically for the race. Proceeds from the sale will be donated to the Juvenile Diabetes Research Foundation (JDRF) to further research for a cure to type 1 diabetes. In addition to making a donation to JDRF, Ford has offered the use of its exclusive Sky Box at the Barrett-Jackson auction to local JDRF families. At the opening of the auction, one JDRF child spokesman will say a few words. Taking part in the live auction proceedings will be Ford Motor Company President of The Americas, Mark Fields. 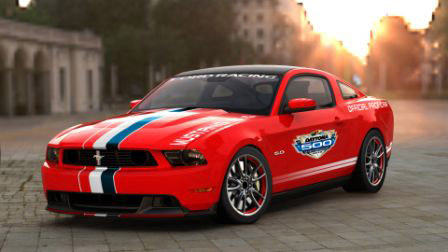 The Mustang pace car will be the first Ford to pace the Daytona 500 since a Torino GT Convertible was used in 1970. In addition to the Daytona 500 paint scheme, the car will showcase a Ford Racing suspension, unique painted wheels and special interior treatment. The car will be powered by a new-for 2011 5.0L V8 rated at 412 hp while still maintaining a class-leading 25 mpg highway. Diabetes affects more Ford families than any other disease. Ford Motor Company has raised more than $30 million for JDRF since the grassroots campaign started in 1998. Type 1 diabetes, sometimes called �juvenile diabetes� is an autoimmune disorder that destroys insulin-producing cells in the pancreas. People with type 1 diabetes must monitor their blood sugar and take multiple doses of insulin daily. Arrange a ride with W Hotel�s complimentary Acura Car Service and enjoy an Acura MDX SUV stocked with W essentials like Tidy Towels, Wish magazines, wet your whistle water and signature W music. The Auto Show package is available from February 11h � February 21st at the W Chicago-City Center (172 West Adams) starting at $189 and the W Chicago � Lakeshore (644 North Lake Shore Drive) starting at $179. We are deeply saddened to announce the death of Fabrizio Violati, founder of Maranello Rosso, at the age of 75, who passed away in the Republic of San Marino on January 21st, 2010. Needless to say a huge loss, Fabrizio was a special person, somewhat larger than life, who best interpreted the value of S I M P L I C I T Y.
Fabrizio always sought the E S S E N C E and never the A P P E A R E N C E S, even in his actions from the pleasure of driving to the pleasure of sailing. In Fabrizio you could discover the taste of adventure, challenge and success. Maranello Rosso keeps the Legend alive with the most significant cars of the Cavallino and Scorpio history, unique cars in a unique set, year after year, 40 years of the Enzo Ferrari and Carlo Abarth production, not only cars but works of art. Maranello Rosso was the Dream of Fabrizio, it represented his Passion and today more than ever he strongly drives us continuously towards the future, towards the most important victory .... the one yet to achieve!